Saturday 27th July. Just too damn hot. 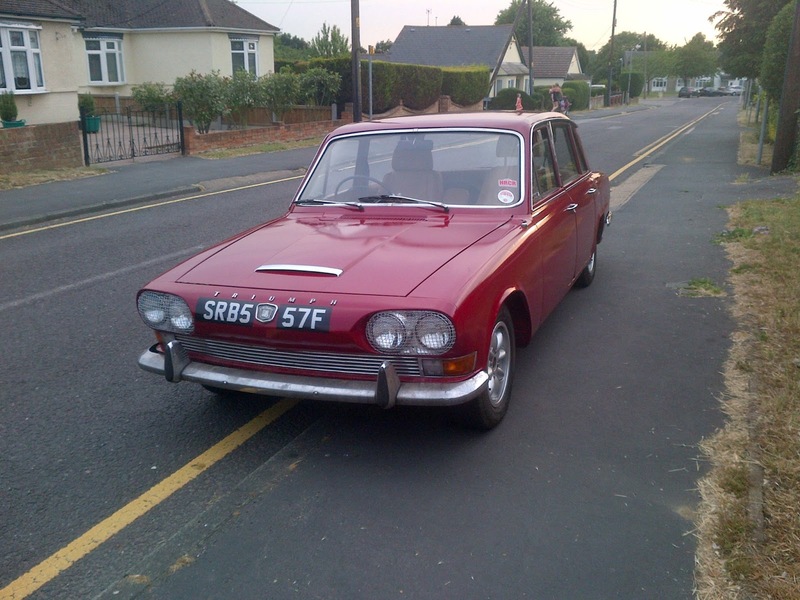 While attending the Triumph 2000 register national day a few weeks back I collected some lowered rear springs for Gavin's Mk2 saloon off of Chris Witor. Now that we both had a day free day, we decided to get them fitted. Gavin's car had always sat higher at the back than at the front so hopefully this would alter that. This is a pretty straight forward job and I always use the method of removing the outer driveshaft in order to lower the trailing arms enough to remove the spring. (and unbolting the bottom of the shock absorber of course) Some people use spring clamps but I find it's quicker and less hassle this way. After about hour both sides were done and a good test drive followed. The car not only looked better, but handled a lot better too. The next job on the agenda was to change the steering rack gaiters on the Red Shed. (I really must stop calling it that!) They were fine when I took it for MOT, but with it recent return to regular use, they had disintegrated and split open. New ones had been ordered and first thoughts were that I had been sent the wrong ones. after a quick perusal in the workshop manual and internet we discovered that one was indeed supposed to be a different shape to the other. The pinion end of the rack has a wide cone and is quite an easy fit. However, the nearside one has a small cone that has to go over a large nut and is quite a struggle to fit. Eventually though, it all came together and the car now has a new pair of gaiters. Next on the agenda was to change the gearbox oil. The gearbox on this car is quite noisy and will need rebuilding sooner rather than later I suspect. I'm not at that stage yet though, so an oil change would have to do for now. We got the car up high enough on axle stands so that I could crawl underneath and undo both the drain and filler plugs. With all the old oil drained, I replaced the sump plug and we then fed a piece of garden hose through the engine bay and into the filler hole and then used a standard 1L gear oil bottle to pour the gear oil into the piece of garden hose. A sort of intravenous drip feed. Much better than trying to squirt it in from underneath and getting covered in smelly gear oil! With this done and it now being around four in the afternoon, both of us were roasting hot and had enough of laying under and working on cars, so we called it a day. Well, that was the intention. By 6pm I was so bored of crap TV that I went back out to the garage for another spell. It was cooler now too, so it wasn't so bad. I'd been meaning to fit some kind of additional cooling on Gertie for a while now and recent finding of a long ago ebay purchase inspired me to get it sorted. It took longer and was more hassle than I thought though but I got there in the end. Getting them up inside the nose cone was a real pig! By the time I had finished it was gone 9pm, but Gertie now has a large set of twin fans awaiting wiring up. Friday 19th July. Off with her head!!! A quick rush home from work on Friday evening saw me get stuck into the removal of the Red Shed's cylinder head. As it had been off only recently there was none of the usual heaving, pulling and swearing that there normally is and it came off quite willingly. The old core plug was then beaten into submission until it popped out and the area cleaned up before the new core plug was given a liberal coating of Wellseal and then tapped into place. I then replaced the head, water pump housing and some hoses before calling it a night as it was now gone midnight. Saturday morning, I continued and refitted the carburettors and by 11am she was running sweetly and not leaking water as before ( Not bad considering I hadn't woken up til 9.30! That's really late for me!) I then had other engagements to attend to so the other outstanding jobs were put off until Sunday morning. I also managed to repair the overdrive that had mysteriously stopped working. This just turned out to be a loose wire on the solenoid. While I had the jack out and was laying on the floor, I decided to drain the oil out of Gertie, replace the filter and carry out an oil change. By now it was the afternoon and the temperature had risen so it was a good time for a test drive in the Red Shed and see if any of it's recent overheating issues were still present. The first test run was up to South Woodham and back via Rettendon, South Hanningfield, Billericay and Wickford town centre. Back at the house, no problems or issues were evident, so another test drive down to Southend and back took place. I'm pleased to report that she gave me no problems at all and was quite a pleasure to drive. The temperature gauge never ventured above half way and she never felt like she was getting too hot. She has a bit of a noisy layshaft on the gearbox but this can wait for the time being. I want to get her a few more miles on her first as she needs to convince me she can be reliable. To be fair I had the same thing with the estate when I first bought her. She was a real nail! I'm thinking about doing the 2014 Round Britain in the estate, but when I first got her I'd have settled for getting round Wickford bypass without the bloody thing breaking down! The next job for the Red Shed will be to fit new steering rack gaiters and then maybe get some music in the car. I need to drown out the sound of that layshaft! Tuesday 16th July- The Red Shed returns. I was calling past Mowatts on Tuesday morning, so I popped in to see how things were going with the Red Shed. I had called in the Thursday previous to see how it was doing only to find they hadn't even started it, but was told ' It's the next car in'. I wasn't best pleased at this so as you can imagine, I was even less pleased when I found that five days later it still hadn't even been started on and was again 'the next car in'. After demonstrating my unhappiness and offering to help with their 'excessive workload' by removing my car from their premises altogether and paying somebody else to do it, they assured me that it would be finished later that day without fail. I accepted this, but reassured them that if it wasn't, then I would be returning the following morning with a trailer to collect the car and would be taking it somewhere else. Later that afternoon I received a phone call to say it was ready, (funny that!) so I headed over there to collect it. They gave me a run down of things that I should look at. Apparently, the petrol tank has quite a lot of crap in it, so an inline fuel filter has been fitted to monitor that, but it could need a new tank if it doesn't clear. They said that the carbs were ok, but I could do with some heat shields on them. (Especially in this weather!) The coil also doesn't put out the voltage it should all the time, so that needs replacing. And......(I'm saving the worst until last here...) the rear core plug in the back of the cylinder head is leaking. Major Bummer! That means the head has to come off again! I'm kicking myself over this as I did consider replacing it before I refitted the head, but took the attitude of 'if it aint broke, don't try to fix it. That'll teach me. Obviously the acid dip had disturbed it somewhat. Anyway, the bad news aside, the good news is that the car now not only runs, but performs beautifully. The power band seems massively increased now with the PI cam and she pulls like a train. It's not only the initial pull away, but she will still pull well from down low third and fourth gears. You can also feel the revs get to a certain point and then feel the cam kick in. It's a brilliant modification that I would recommend to anyone with a Mk1 with a standard 2000 engine. I stopped off at Gavin's house on the way back and let him have a test drive in it and he was seriously impressed. He thinks it's quicker and pulls better than his 2.5 Mk2 saloon. Another bonus is that you can use the PI cam in the HRCR regulations as it was a 'period modification' used at the time on the works rally Triumph Mk1 saloons. To be fair to Mowatt's they do carry out a fantastic job and every car I've given them has come back from there like a different car. They certainly know how to get a car performing I'll give them that. So, a new head gasket has been ordered and this weekends work will be to remove the cylinder head and sort out what I should have done while it was off. Lesson learnt! Saturday July 13th. A nice little day trip. Today was the main show day for the Triumph 2000 Register's annual national rally. As it's the 50th Birthday of the Mk1 Triumph 2000 saloon, the idea was to try and get 50 Mk1's present. So I decided to play my part, but with the Red Shed still in Mowatts, the only option was to take Gertie along to add to the numbers. Dave Maton was my co driver for the day and after setting my alarm for the ungodly hour of 4.15am I picked Dave up at half five. After a trouble free run to Reading services we stopped for a coffee and a driver change and Dave took the wheel to the next brief stop at Gordano services. I normally only see Gordano services at around 3am on a Sunday morning when we are doing the round Britain, so it was a tad more busier than I was used to! The amount of people, cars and caravans in the car parks showed that a lot of folk were heading South, so we only stopped for a few minutes to try and keep ahead of the traffic. 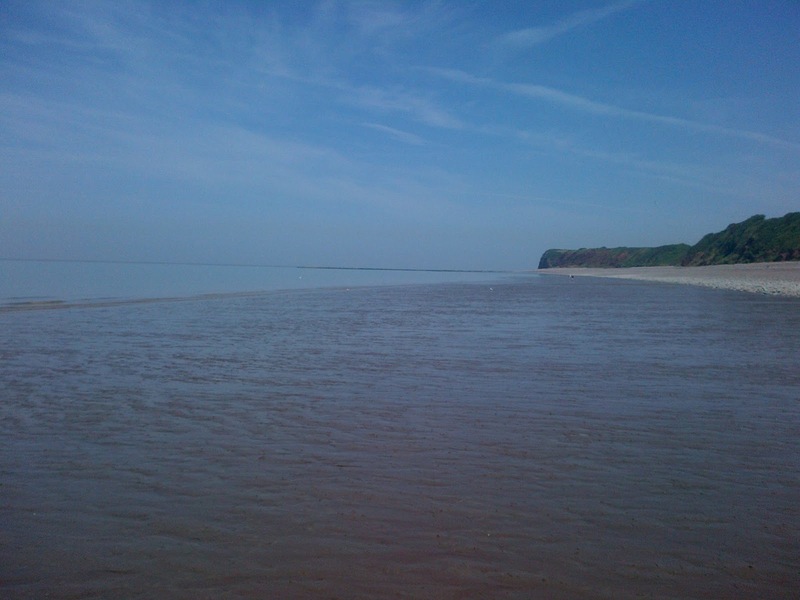 This was supposed to be the hottest day of the year so far, so we suspected a lot of people would be heading coast bound as we were. The M5 was starting to get a bit sticky, so we turned off a junction early and took the A39 down towards our destination. We managed to find a snack van in a layby, so we stopped for a bacon sarnie, although the bread could have been used as plasticine and the bacon could have done with an oil change! 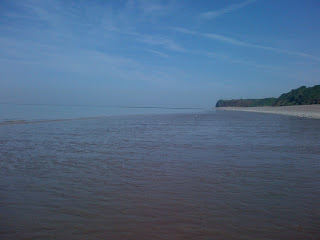 We arrived at our location at St Audries Holiday Club at West Quantoxhead near Watchett in Somerset at around 9.15am. What a beautiful place this was. If I had known how lovely it was I would have probably made a weekend of it. The show field backs on the beach and sea and makes a beautiful backdrop. There were quite a few cars there already and some of the owners had made a holiday of it and been there all week. 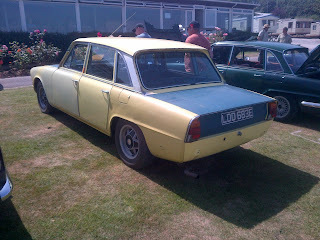 A very nice surprise was seeing my old Yellow Mk1 there. LDD683E is now owned by Peter who had got it MOT'd recently and had brought it down from Cambridgeshire. Pete has done some great work on the car and is now getting it ready for some new paint. It should look good when it's done. 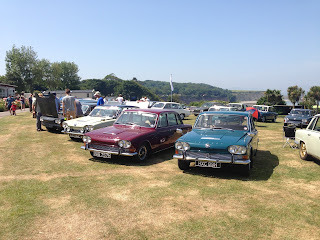 We had a brief look around some of the cars that were there and then met up with Ted Taylor and Mike Weaver who Dave had a meeting with to do with the new spares group that was formed earlier this year. Dave went off to his meeting while I err.........wandered off to the bar for a pint of Guinness. Well it had gone eleven! More and more cars kept arriving and the MK1 count was rising slowly. Would we reach the fifty cars required? The prize giving took place at around 4.30pm and there certainly was some beautiful cars picking up trophies. Lee Godfrey also won an award for services to the club and Dave and I both thought it was very well deserved. Lee is a bit of an expert on MK1's and quite often knows of cars for sale and is very helpful in this area. He's a real nice guy too, so if you're after buying or selling a Mk1, he's definitely the man to see. Dave and I left shortly after prize giving as we still had a few more miles to get through. We stopped for fuel and food at Asda's just off the M5 at Bristol and then just cracked on home. The run back was luckily traffic free and completed with both front windows wide open as it was so damn hot. By the time I'd dropped Dave off and stopped off the at the offy for some ice cold beers (The Guinness had well worn off by now) and put Gertie away in the garage it was around 9.45pm. So quite a long day then! Gertie completed the days 446 miles faultlessly although the temperature gauge was creeping up while driving though town. I know it's unusually hot at the moment, but I think an electric fan may be the way forward for the future. Saturday 6th & Sunday 7th July. Bad day-Good day. Saturday morning started well but very quickly turned into quite a stressful morning for me. The Wednesday night before I had committed a good few hours to the Red Shed, but had left the garage with her running really well. She was booked into Mowatts for a rolling road session to have the carburettors set up and Gavin had come round to give me a lift back as I had to leave her with them. I took Gavin for a quick spin round the block her before we left and even he commented how well she was running. He spoke too soon! Within half an hour of leaving my house this damn piece of Red junk had broken down! We initially thought it was the needle valves in the float chambers sticking, so a tap with a small hammer seemed to cure the problem and we got going again…….for about 500 yards. The same treatment managed to get us another 500 yards before we broke down again! This time we managed to find a screwdriver under the seat (We hadn’t brought any tools!) and undid the fuel line to find that the petrol pump had gone in to semi-retirement. So we primed the pump by hand until the carbs filled up and set out again……for about three hundred yards this time. Unfortunately this was now the order of the day. By now we were on the A127 which is a busy dual carriageway with the usual mindless twats whizzing past only inches away while we tried to coax this thing back into life. It eventually took us 55 minutes to cover the two miles from my house to Mowatts. As well as the carb set up and electronic ignition she was originally booked for, she is now having an electric fuel pump fitted as well! I am not pleased with her at present, so maybe it's just as well she is out of my sight for a while. Sunday was a bit more chilled (except the weather, which was very hot!) as I took a trip out to the Classic car show at Maldon. I took Gertie along to this one. The only concern that Gertie gave me was that the temperature gauge rose to three quarters while we queued to get in. Maybe I should look at fitting an electric fan. It was a gorgeous day and there were quite a few cars in attendance. 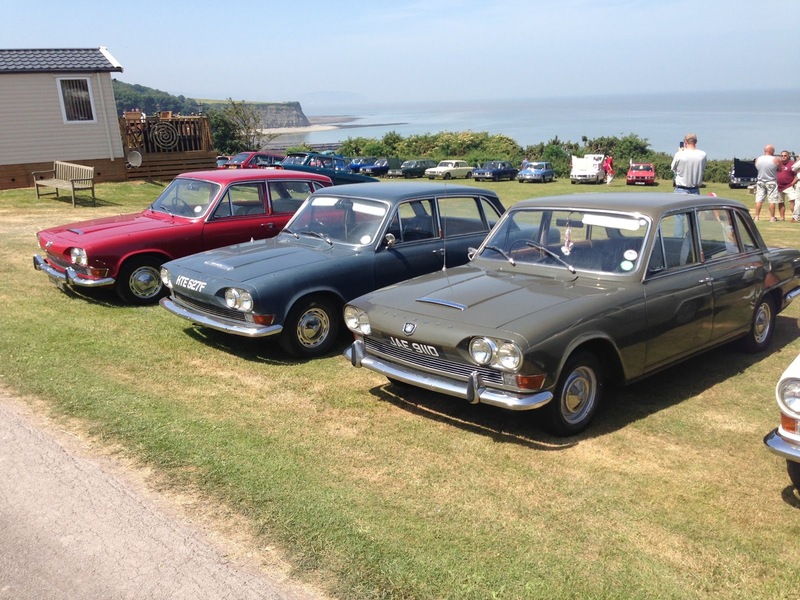 Pictured below are some of the cars from the day. This Mk1 had 4 doors but 8 cylinders! Now this is what I like. Maybe I should sell the estate and the Red Shed and buy me one. June 29th. The Red Shed is alive and............ well it's alive anyway! With a Saturday finally free to myself, the mission today was to get the Red Shed running again after its recent engine removal. Gavin was free as well so he came round to help with things. With all of this done I then went to refit the distributor and promptly dropped it into the engine bay and broke the rotor arm in two. Bugger! My spares box of rotor arms revealed itself to be about as full as old Mother Hubbard’s cupboard, (I’m showing my age now aren’t I?) so a nice shiny red one was stolen from Gertie while I get some more on order. So, with everything back together. It was time to attempt starting. We had set the timing dead on when we started, but still had to turn the distributor in order for it to start. When we turned it back to where the timing marks should be on the pulley, it just wouldn’t run at all. We removed the cog wheel several more times and repositioned it to try and make it make a difference but nothing did. The problem being is that the cog wheel turns as it meshes with the teeth on the camshaft when you drop it in, so you have to allow for the turn. If you don’t get it right, you can be one tooth out every time. Finally, on the last try (Obviously) everything seemed to line up better and the rotor was finally pointing at number one plug lead on the distributor cap, instead of just before it, or just after it like it had been. A test drive revealed that the engine was running way too weak and we suspected it would do. (This is due to the PI cam that’s now fitted.) A bit of messing about with the mixture on the carbs gave a bit of improvement, but I think it really needs to go to a specialist with a rolling road now to set it up properly. After all, now we’ve changed the cam, the carburettor needles may need changing as well now. So, the car is now booked into Mowatt's in Basildon for a set up and rolling road session. She will also be having electronic ignition supplied and fitted while she is in there.